I used to do this ‘thing’ in my relationships where I’d spontaneously slip into a bad mood and, without taking the time to figure out why I was feeling that way, I’d shut out someone I loved. It was a defense mechanism that had worked for me for 30+ years. But…not only was I denying myself from feeling my emotions, I was hurting–and confusing–the person on the receiving end of my own personal “Occupy What-the-hell-is-going-on-with-me” movement. And it stunk. This past Sunday, I started to feel that ‘thing’ suddenly creep in again. It’d been awhile so I wasn’t expecting it, just the way you don’t expect a Jehovah’s Witness to ring your doorbell at 9 a.m. on a Sunday morning. There was no advance warning, just a tidal wave of icky bitchiness. ‘Not again,’ I thought. This time, however–thanks to my meditation practice and studying the work of people I admire (Raphael Cushnir, Mastin Kipp, Katherine Woodward Thomas)–I was able to immediately identify the trigger: residual pain from past relationships. After I hung up the phone, I went for a run. It seemed like a sensible antidote to the ‘stuff’ swirling around in my head. I ran faster and longer than I had in months. As I was finishing my last lap, I noticed that a vintage light blue Cadillac had pulled up and parked on the grass next to the track. It seemed strange since this was a high school and there were empty parking spaces everywhere. I spotted the driver of the Cadillac, an older man, walking in his dress shoes on the other side of the track. And then I had a crazy thought: what if this was the Universe’s message to me that I was being checked up on? What if this white-haired man (whose face I could not see) was really God–or the embodiment of the Universe–to let me know that I was doing good work and that when we do good work, God shows himself? If this was God…and God does, in fact, drive a Cadillac…well, then the Universe has a great sense of humor. An older white-haired man walking the track in his dress shoes you say. I can think of “someone” else we know a little more earthly than God! Either way – I love that you recognized the whole experience as an omen. 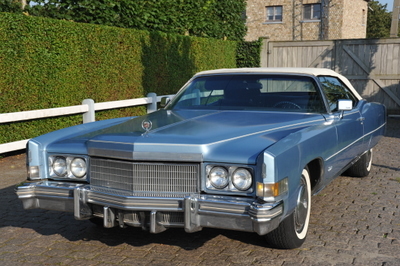 The old blue Cadillac also reminds me of an old blue Cougar! Love your honesty with your new man. It will only make the relationship and individuals stronger. I’m right there with you on the fear. It can drive you mad. But, if you name it and share it, hopefully it’ll go away … or get easier to manage. Really a beautiful post, again. You rock!